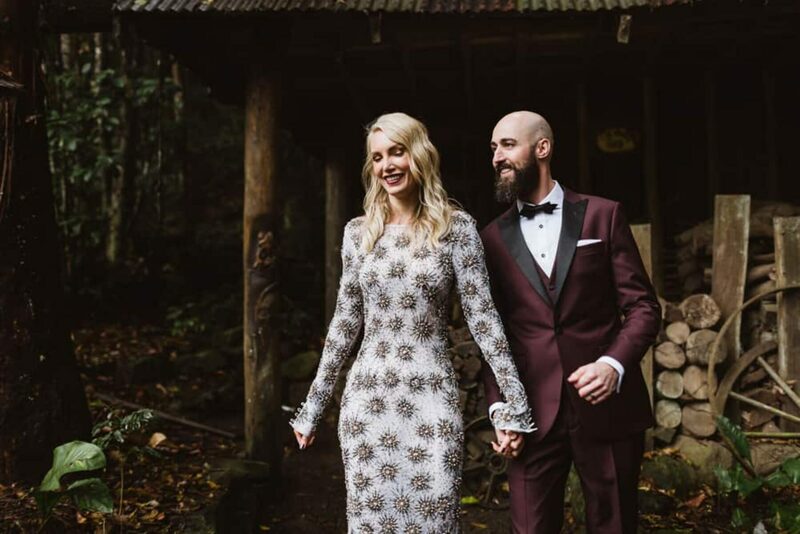 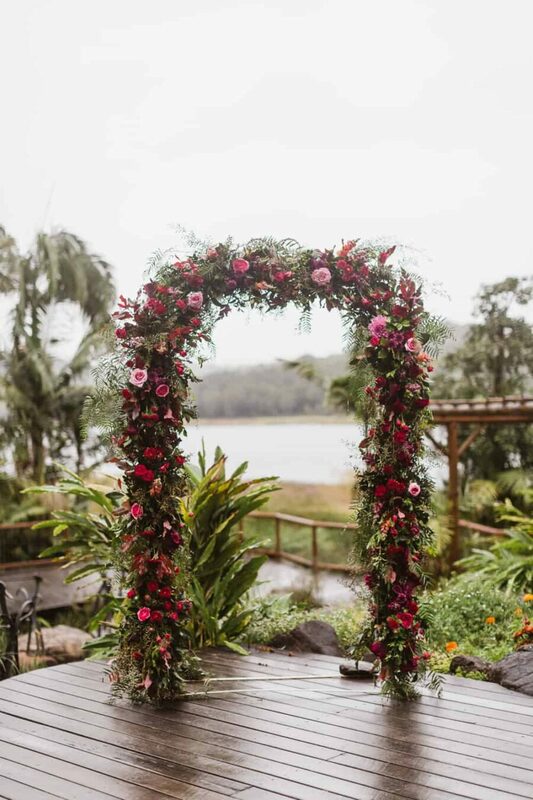 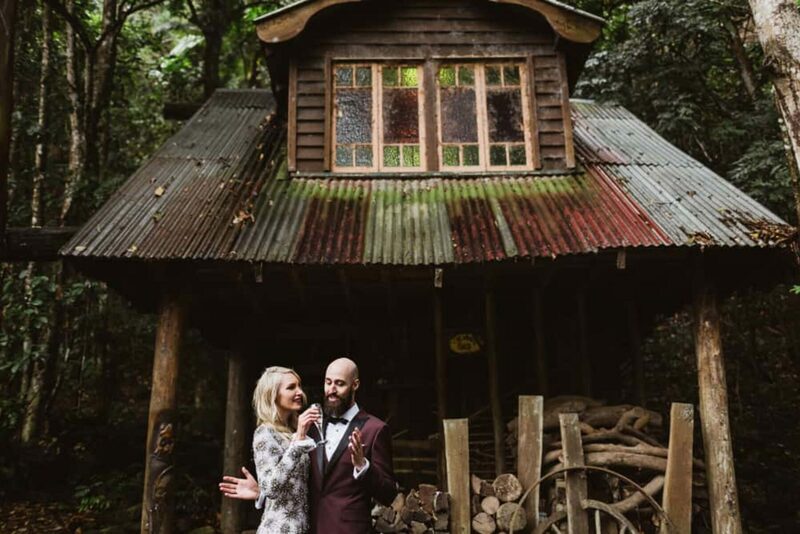 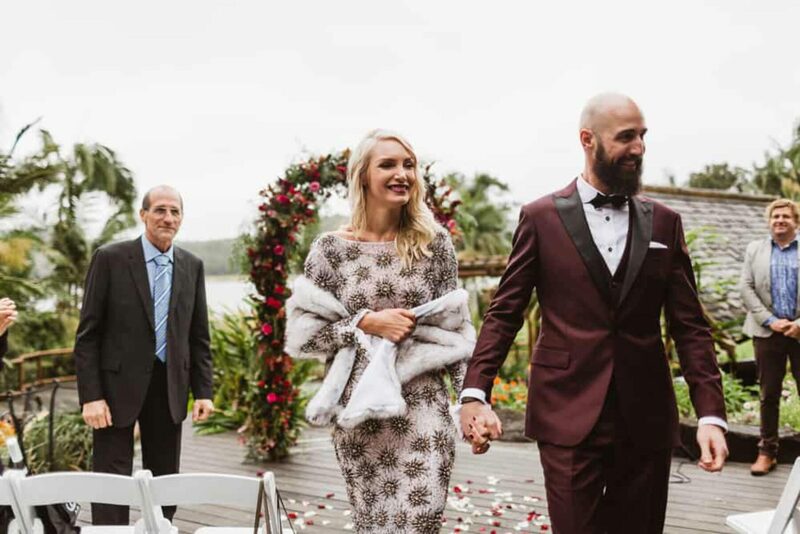 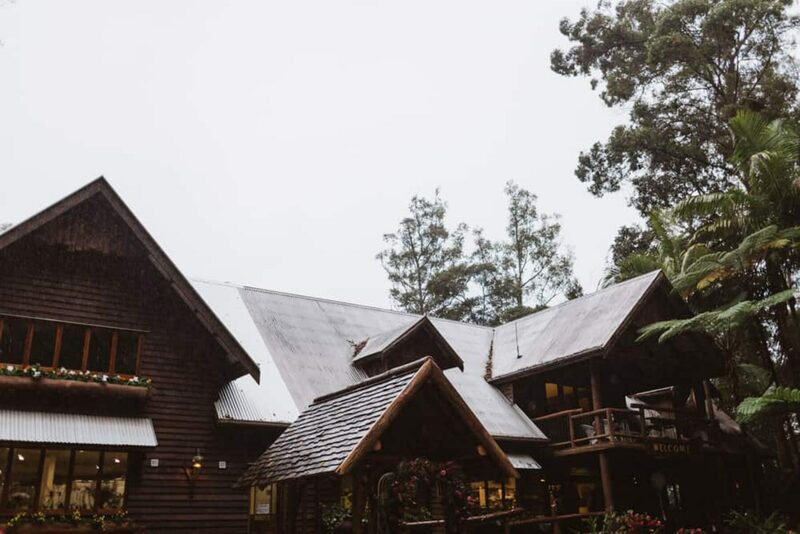 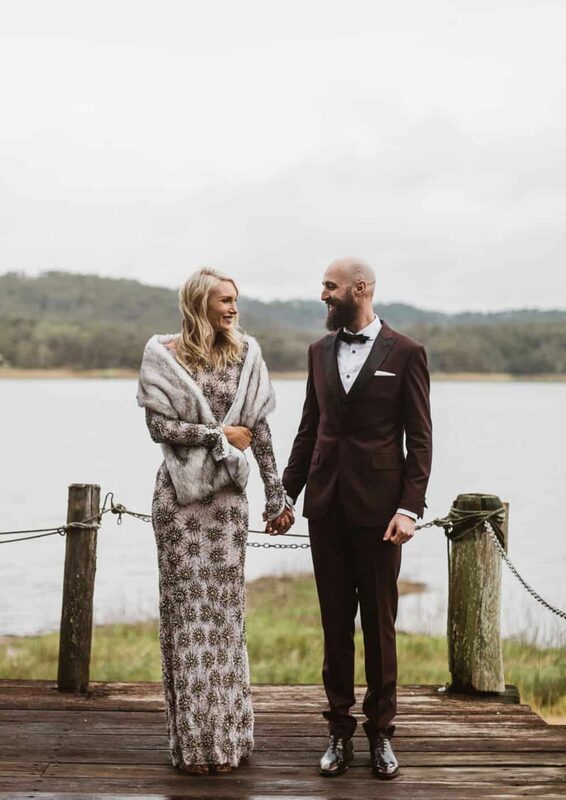 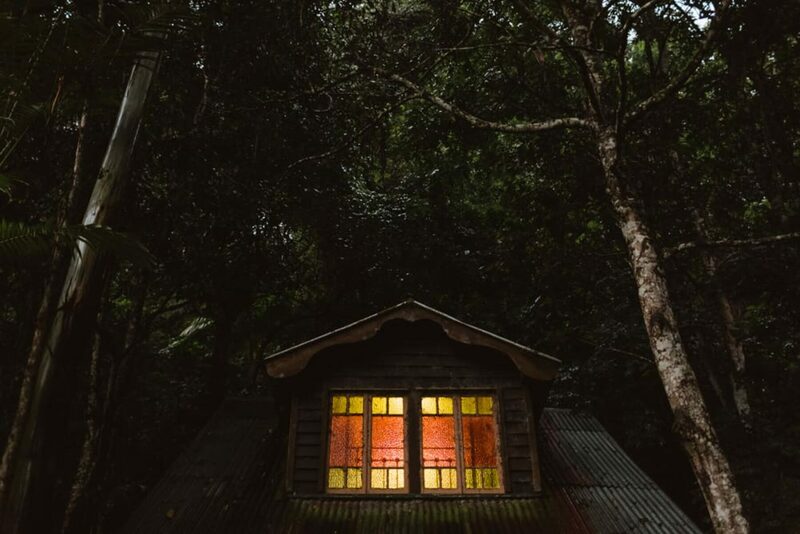 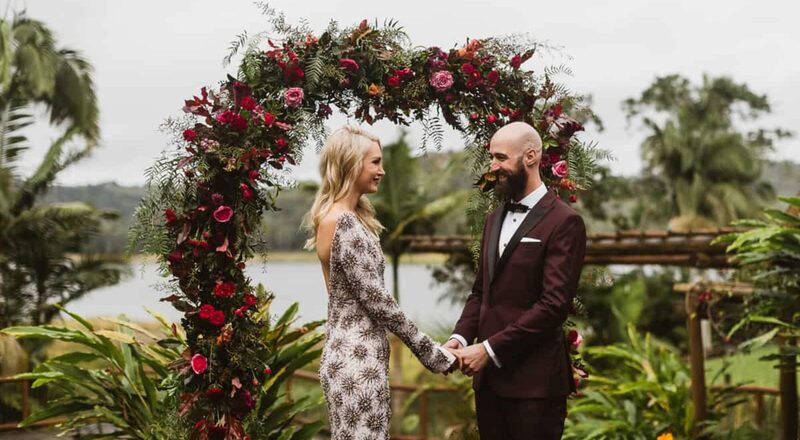 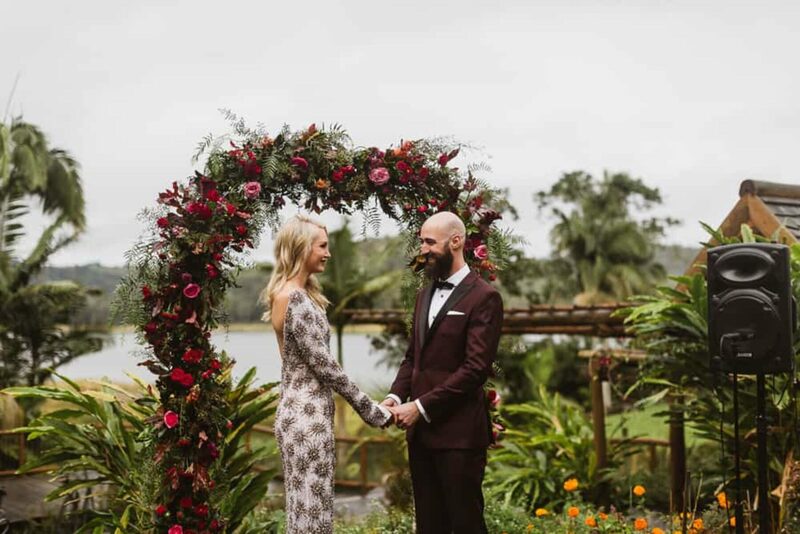 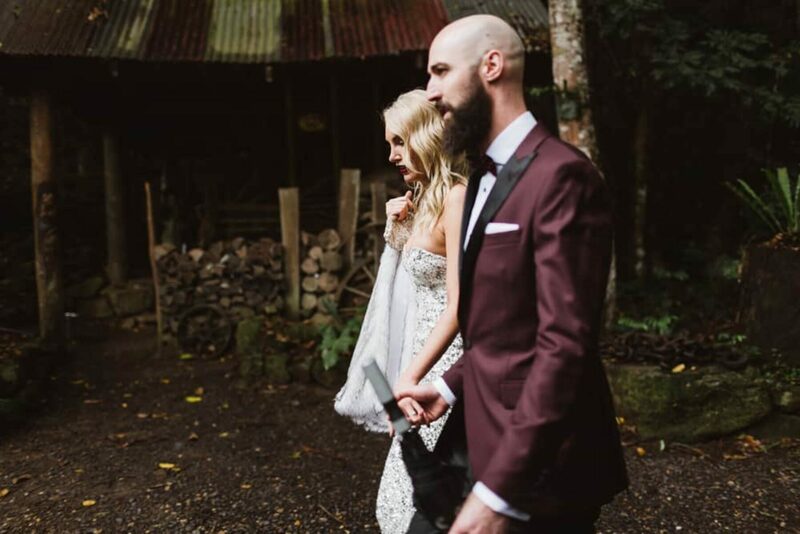 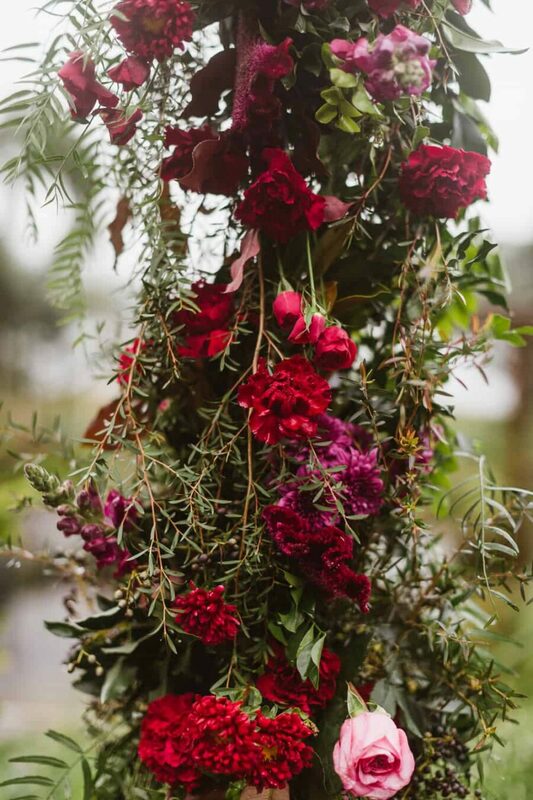 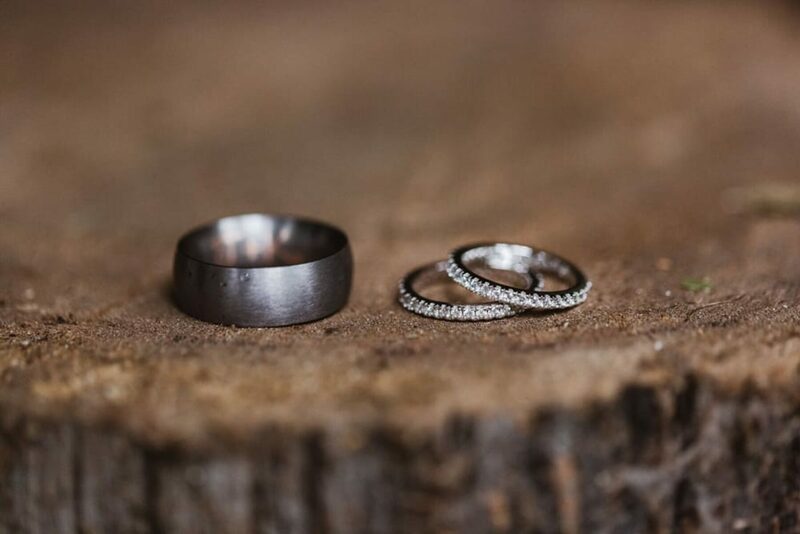 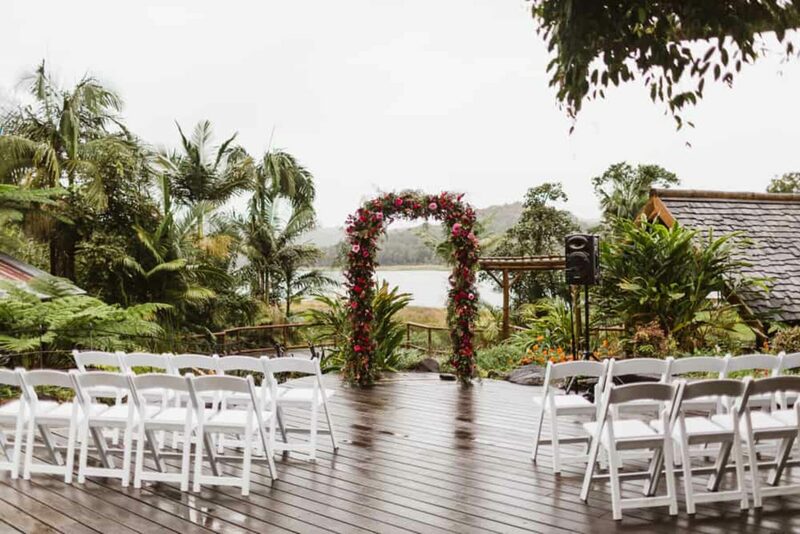 Despite a drizzly day and ominous skies, Jill and Kai’s rainforest wedding at Montville’s Secrets on the Lake was still picture-perfect and we can’t get enough of Janneke Storm’s gorgeous frames. 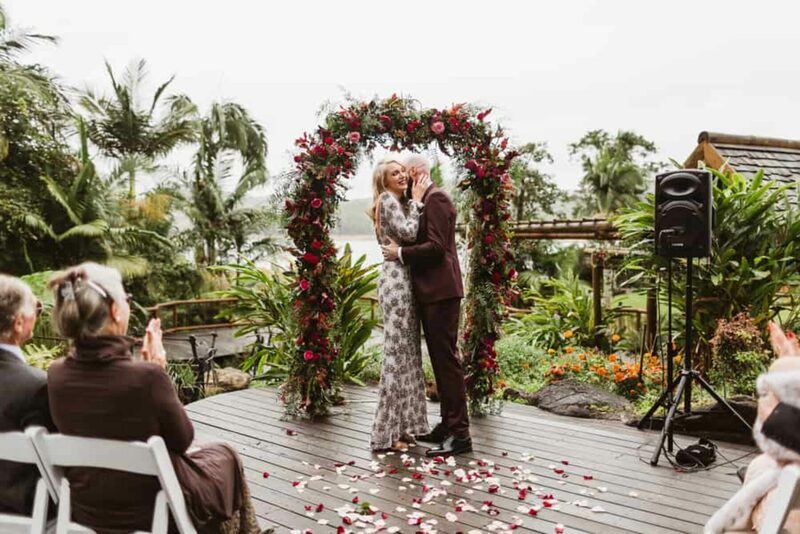 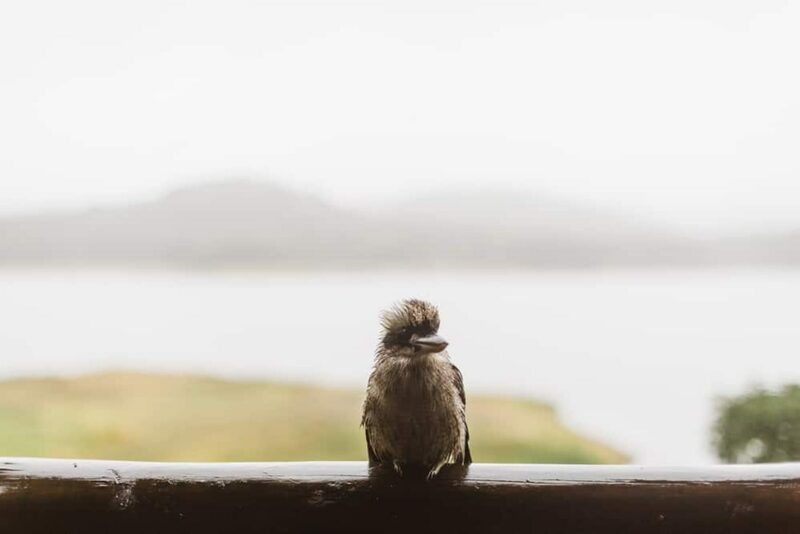 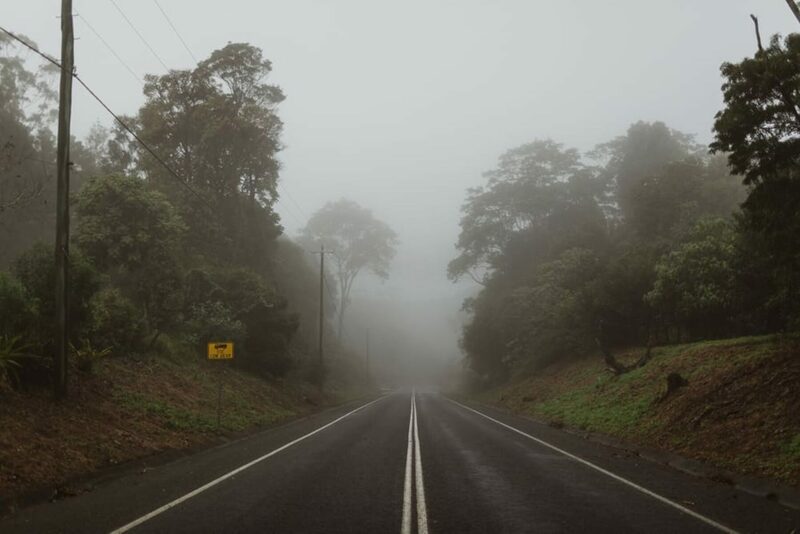 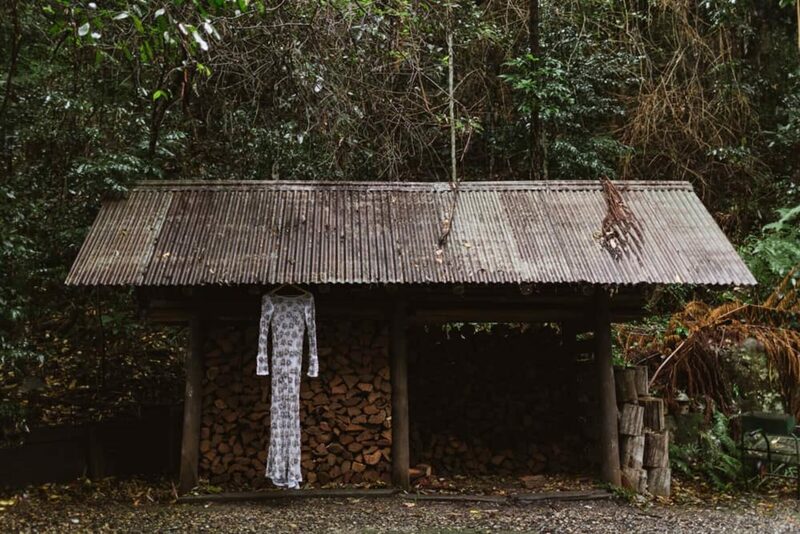 With the pitter-patter of rain, Jill’s celestial gown and some possums and kookaburras dropping by to seek shelter, this wedding couldn’t have been more magic. 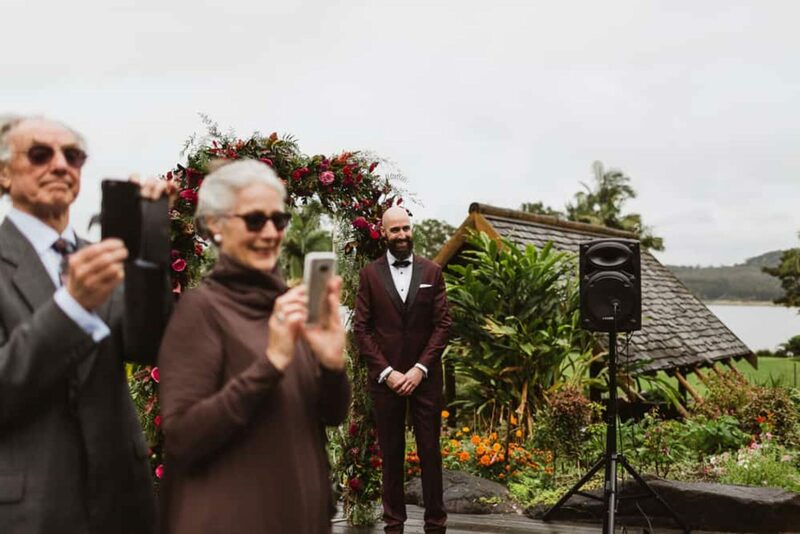 We love a creative proposal and Kai’s certainly meets the criteria. 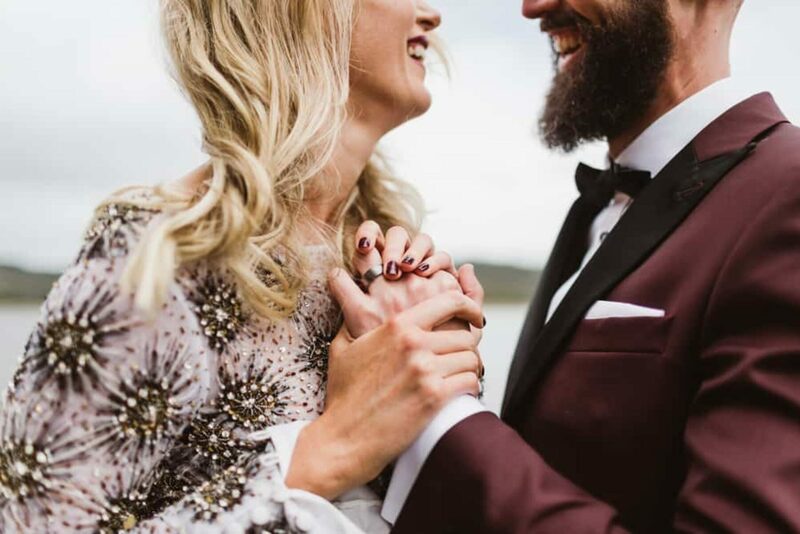 With a reservation at their first date restaurant, Kai presented Jill with a box of customised Lego people made especially to look like them, the female one even wore a tiny argyle diamond! 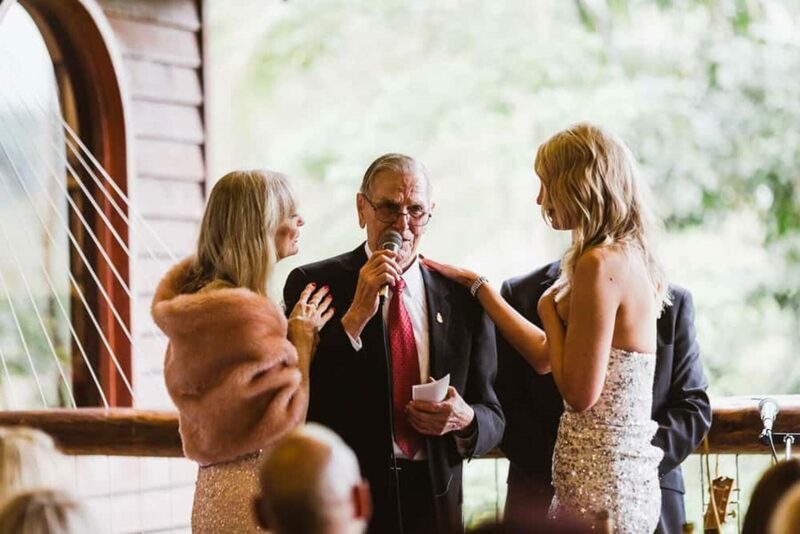 “When I opened the box all I could say is “What is this? 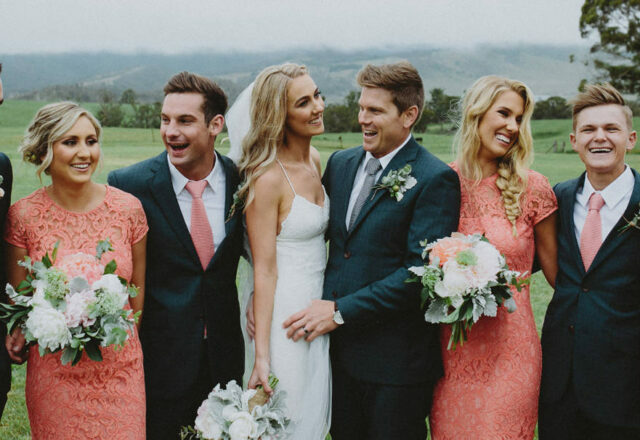 What are they doing?’” Laughs Jill. 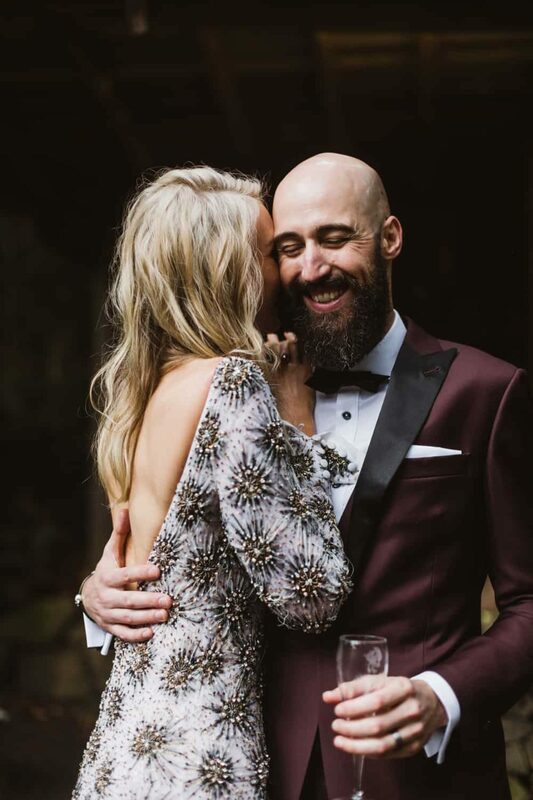 “Kai said, “They are doing what I’m about to do…” then got down on one knee in the middle of the very busy restaurant! 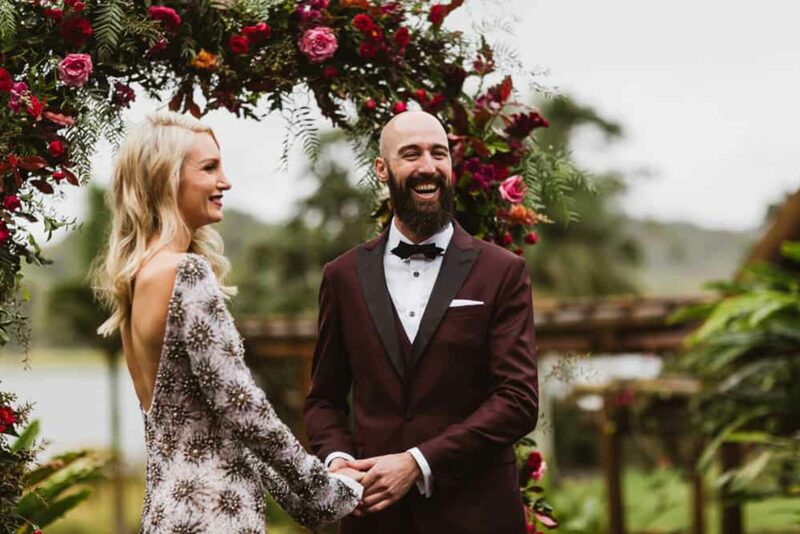 This nature-loving pair wanted an intimate ceremony and relaxed reception and although they’d planned to hold the entire wedding outdoors, the rain only held off long enough for them to say “I do”. 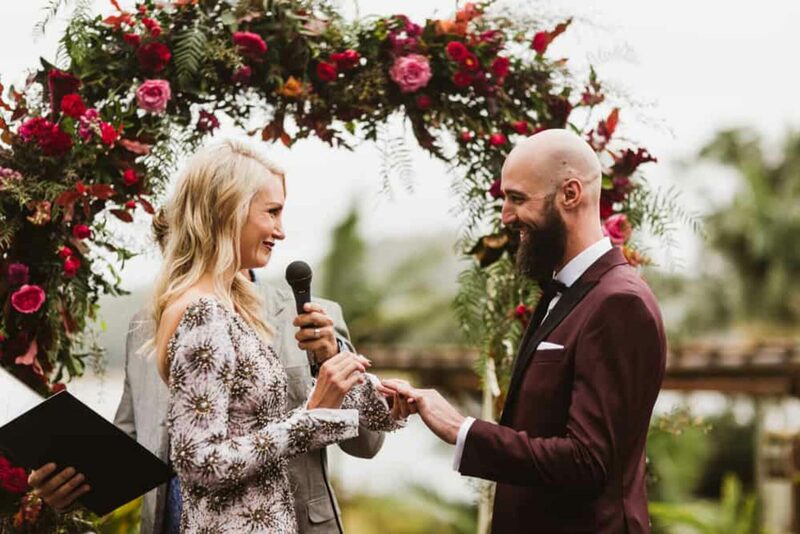 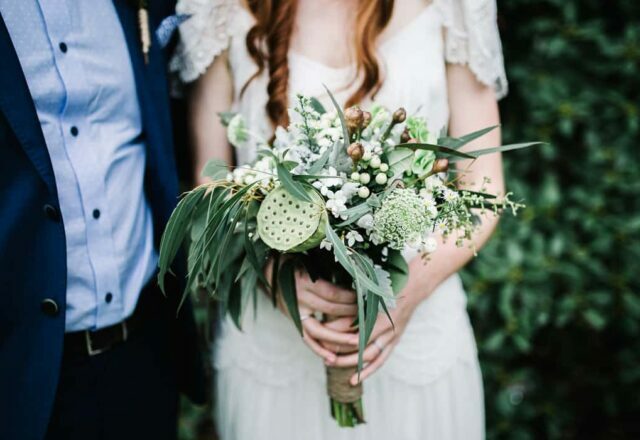 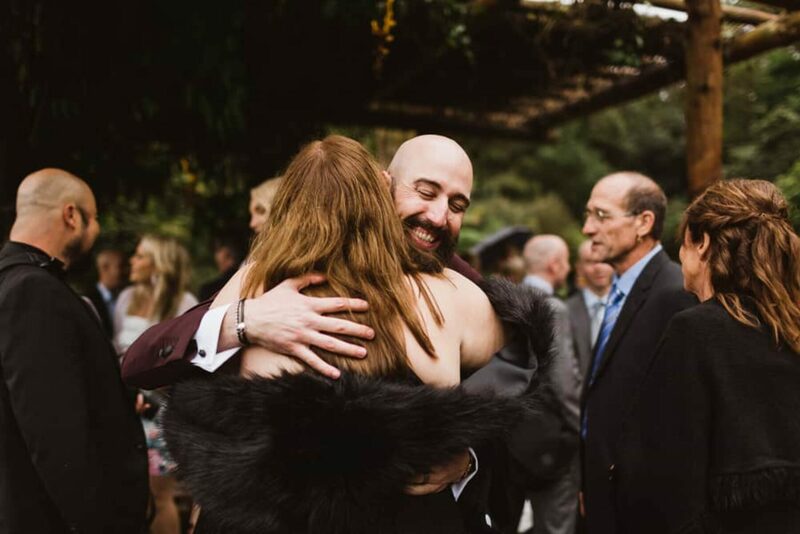 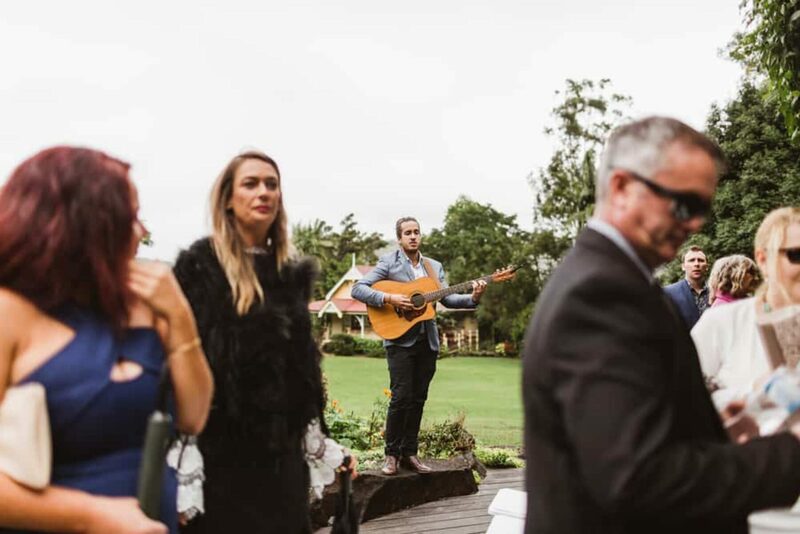 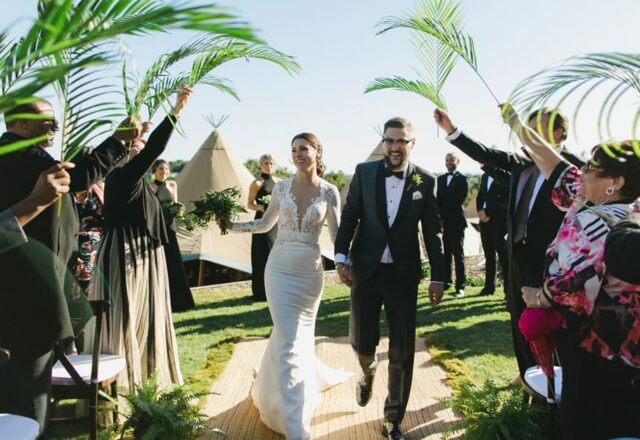 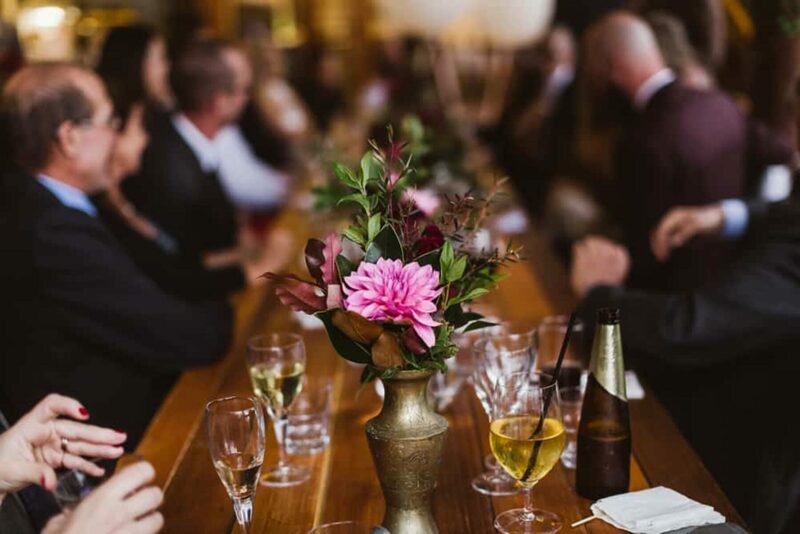 The rest of the evening was relocated to the onsite restaurant and they kept the good times rolling post-wedding, inviting their guests to spend the following day with them on the Sunshine Coast at Aussie World – what’s a wedding without a little adventure? 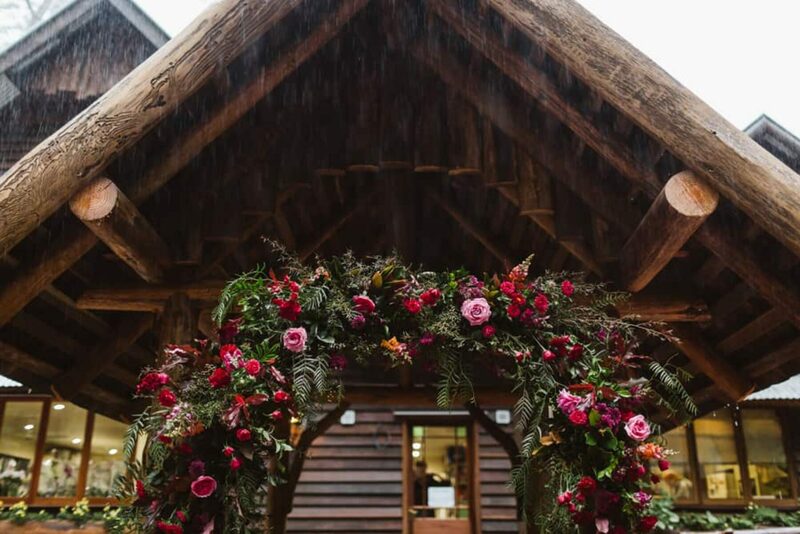 Willow Bud Wedding Flowers were responsible for the beautiful blooms, including those adorning this gorgeous arbour and according to Jill they were v creative and prompt. 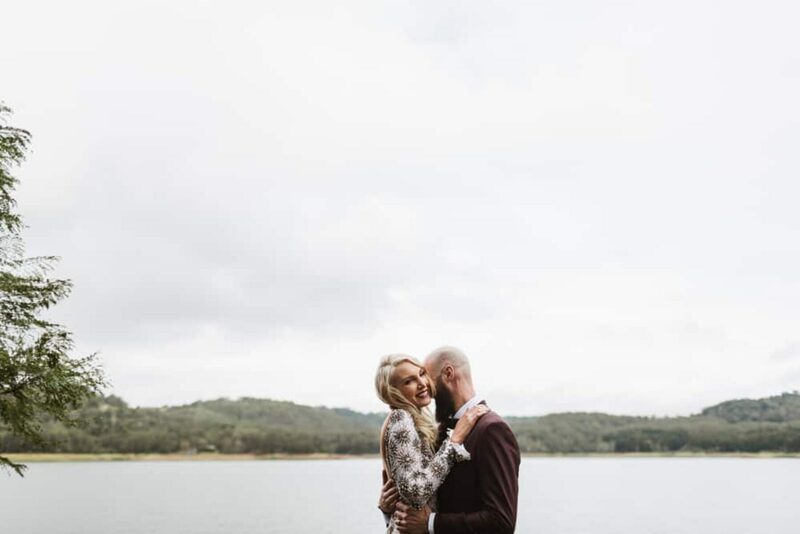 Brownie points, guys! 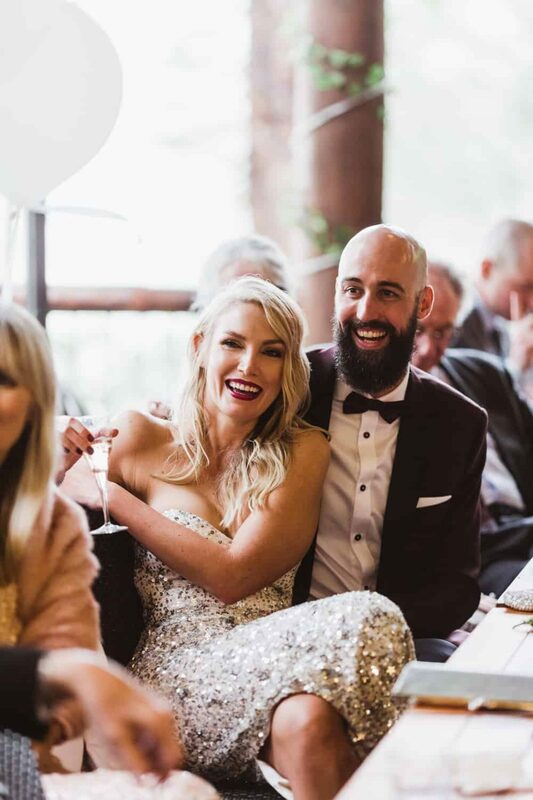 As if this babin’ bride didn’t already shine enough, she had a series of sequinned gowns to ensure extra sparkle. 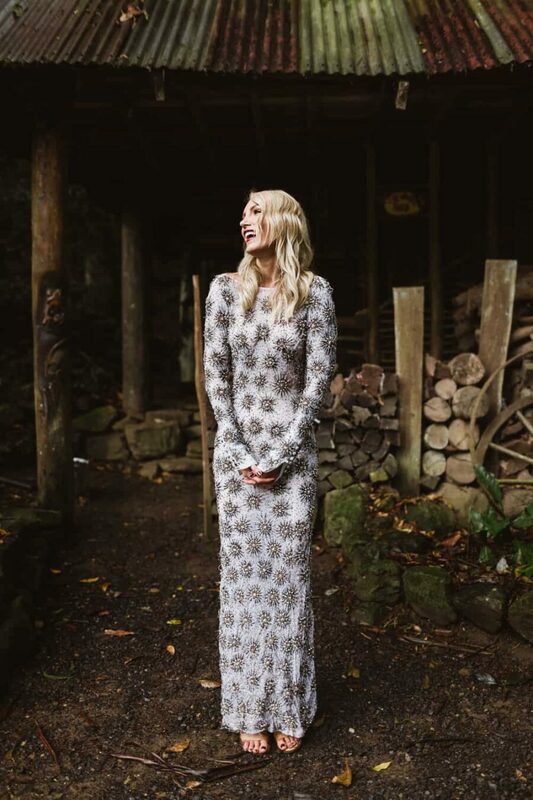 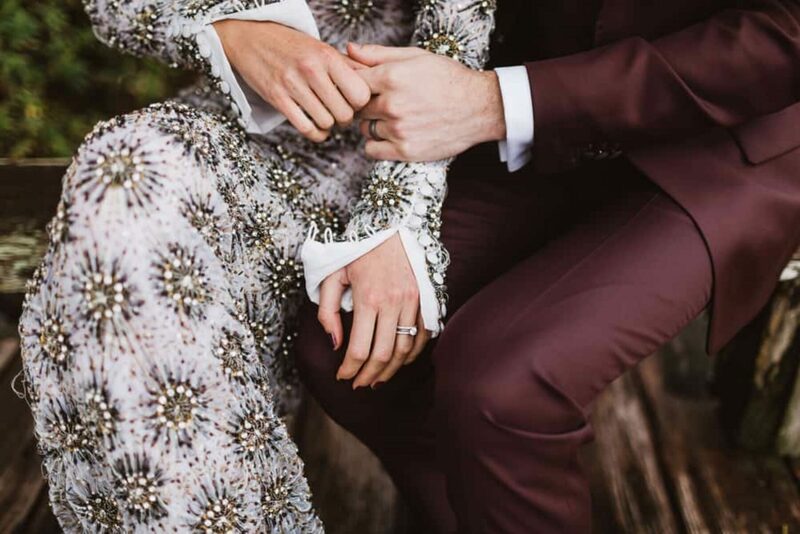 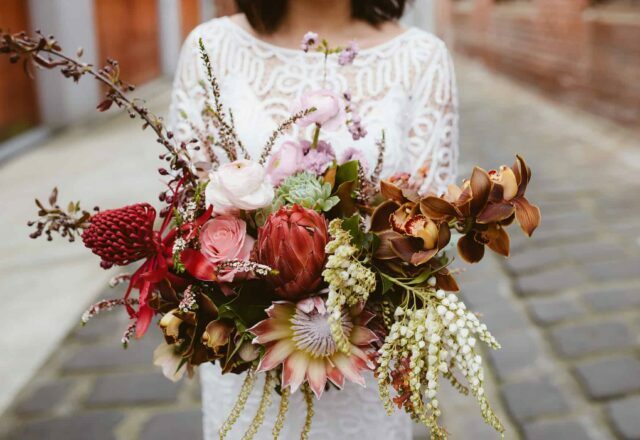 Lusting over that stunning long-sleeved ceremony number as much as we are? 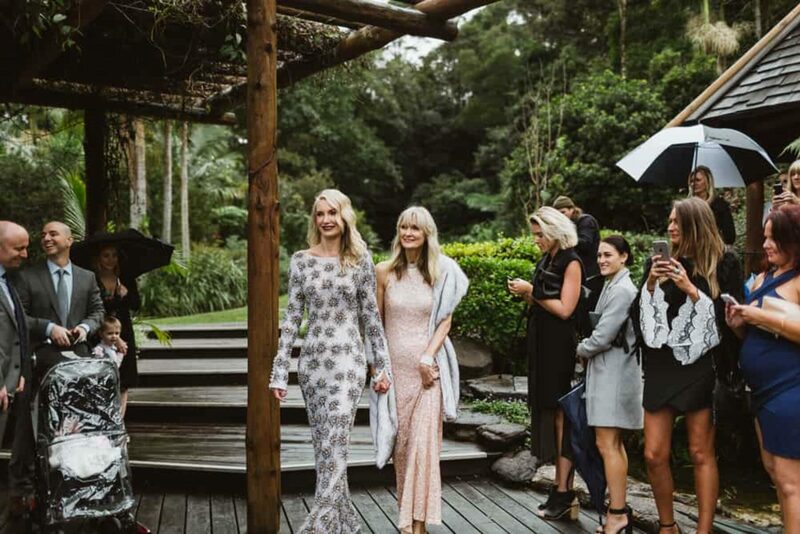 It’s a one-off http://a-j-e.com.au/Aje piece, straight from the MBFW runway - the envy is real. 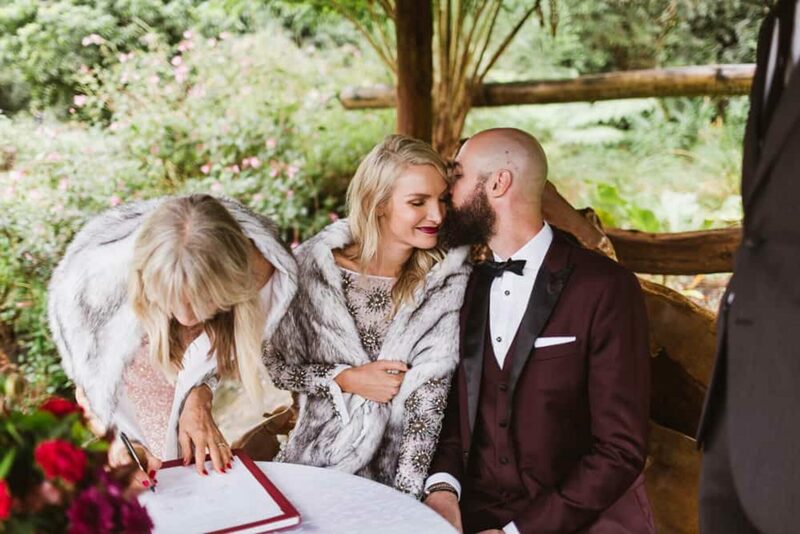 A strapless and glittering Eileen Kirby gown and IDA Faux Fur shawl did the job for the reception and Jill’s midas touch is undeniable. 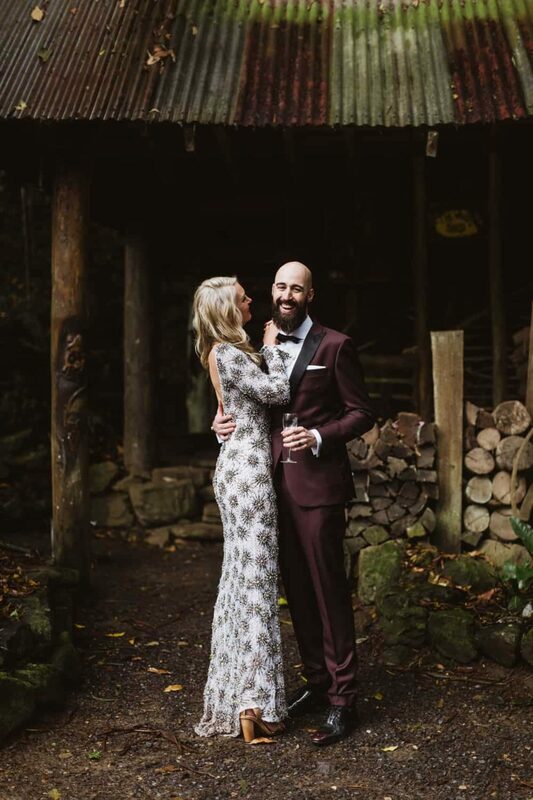 Kai is all about eclectic fashion choices and his wedding kit is no exception. 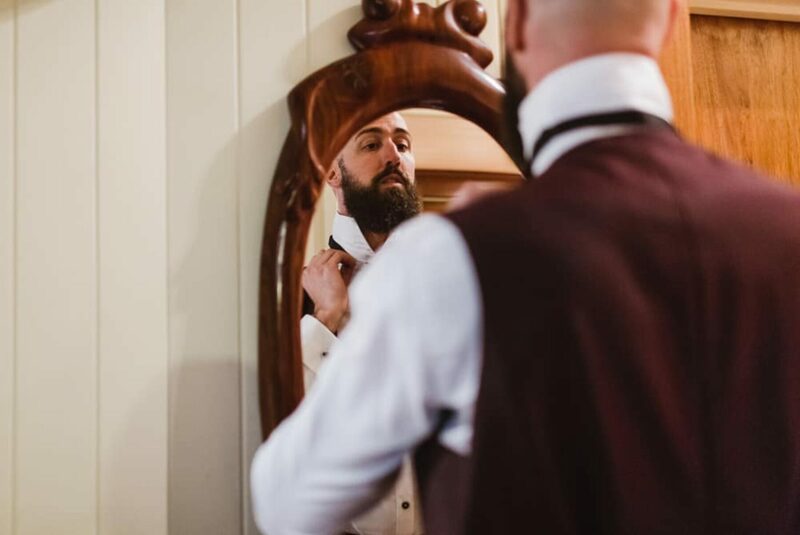 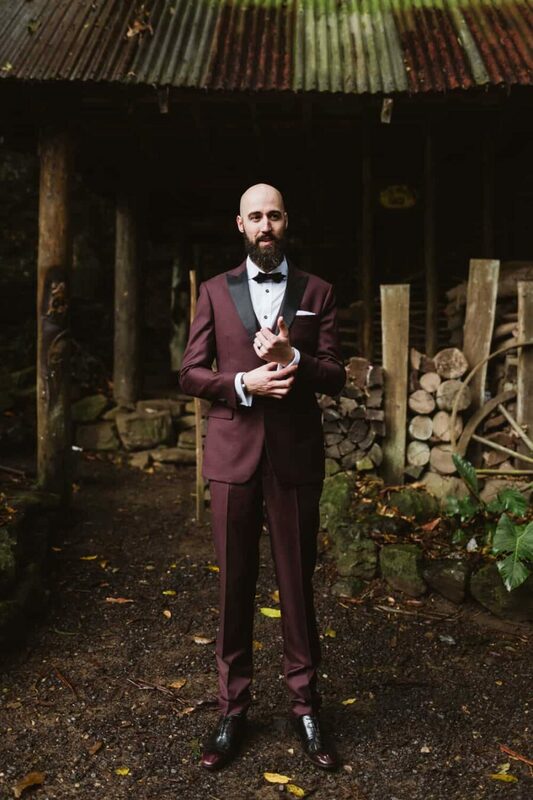 A three-piece custom made burgundy suit from Institchu, paired with skull Alexander McQueen cufflinks and some flamboyantly patterned Happy Socks did the trick for this stylish groom.